Part of the sleek interior of TAG/RAW BAR. together when I tried my hand at making sushi at TAG/RAW BAR restaurant. 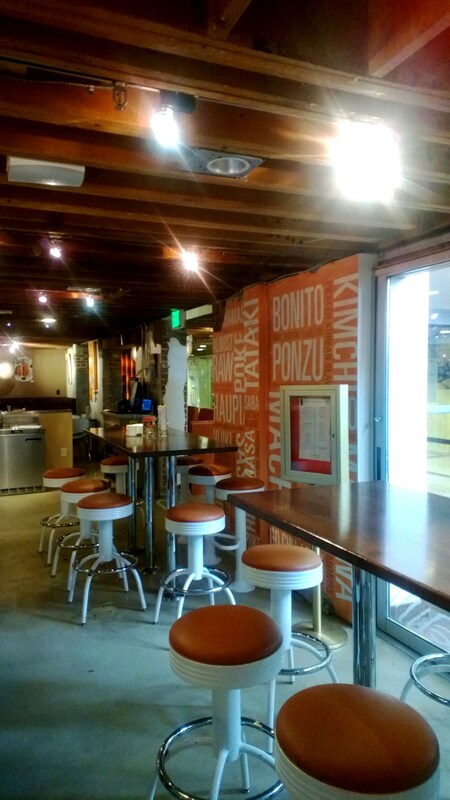 It’s one of their Raw University series at the subterranean Larimer Square restaurant that specializes in sushi, noodle bowls and bento box meals. When I and my fellow classmates first arrived, we had the restaurant to ourselves, sitting up at the white, marble bar, overlooking the open kitchen. Awesome! But then people came in. To eat. What the heck? How were we going to have the undivided attention of our teacher, Sous Chef Shaun Motoda? We had already learned about the importance of sticky rice and how to make it and had even made our first sushi, a Handroll. How were we going to progress with the interruption of people’s orders? Easy. They became teachable moments! With some basic knowledge under our belts, watching Motoda in action was like getting a sneak peek into what we could, someday, strive for. It’s one thing to watch someone making sushi but it’s another to watch when you have a beginning (really, really beginning) sushi chef perspective. Classes start with a cocktail. For our sushi themed class, it was “Ninja Juice” and included ginger, sake, lemongrass syrup and coconut milk. It was garnished with a pomegranate seed-stuffed lychee. It warmed us up for the tasks ahead. (You are sent home with the recipe). Sushi-making is complicated business! 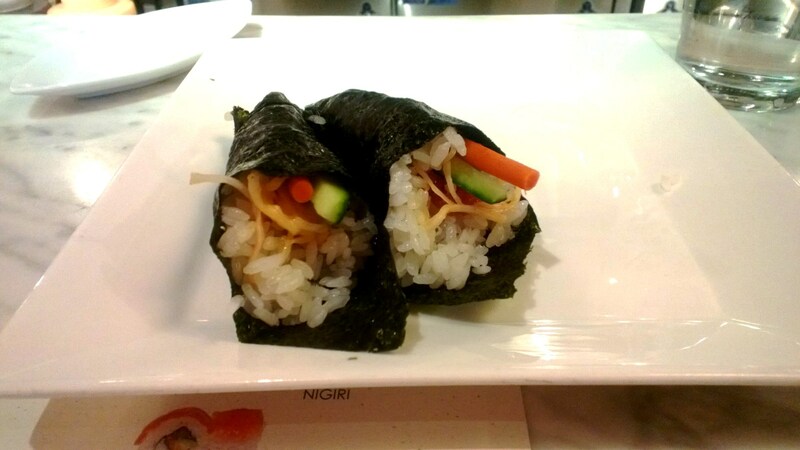 There are very specific steps you have to take and certain ways to mold the rice, add the vegetables and/or fish, roll the thing and even cut it and present it. Motoda made it look easy. We made it look hard. 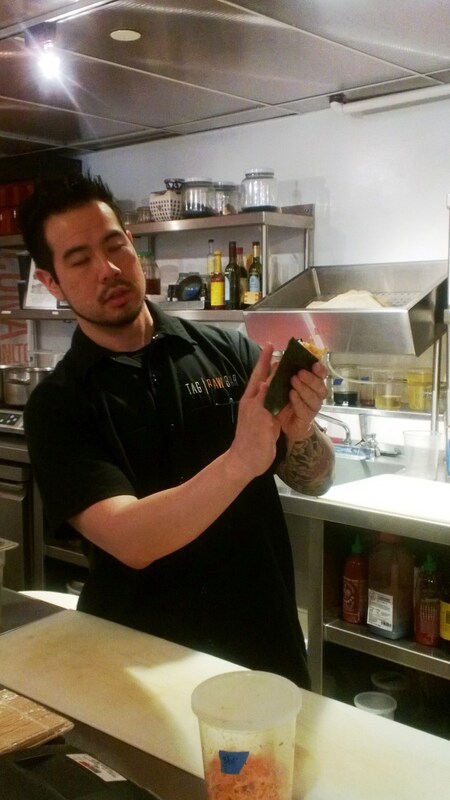 I had to laugh at the site of us all practicing the proper way to hold certain types of sushi in your hand to simultaneously maintain the shape of the rice oval while pulling down and tucking the piece of fish on top…my hand was cramping trying to get it right. 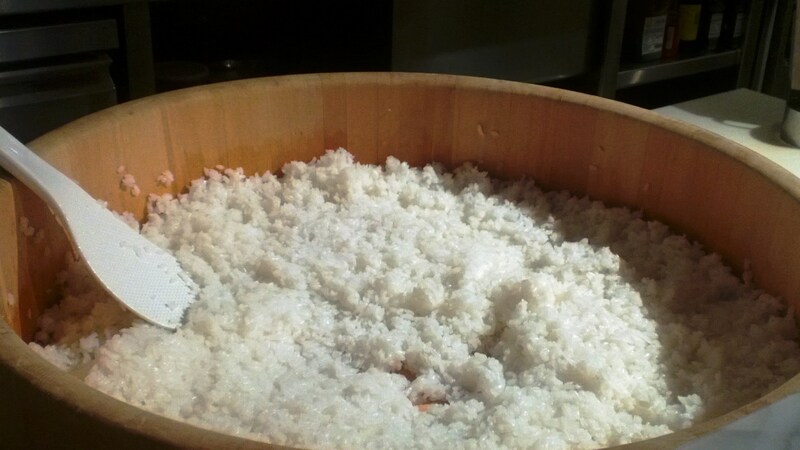 It starts with sticky rice. We all got our turn behind the counter, practicing what we’d just been shown. Some were naturals at it. I had sticky rice stuck to my hands and shirt. It wasn’t pretty. But it was delicious. We got to eat all of our works of art/disaster. Funny thing, it tastes just as good whether it’s a beautifully formed thing or a disintegrating blob. Teacher, Sous Chef Shaun Motoda. He was very patient with us. The Handrolls I made. Pretty easy. These require a lot of manual dexterity, which I don’t have. As an added bonus, Shaun gave us great tips about sushi-eating etiquette such as – except for very large pieces, you are supposed to put the entire piece in your mouth – no biting it in half. Don’t pour more soy sauce in your dish than you will use for that one piece and just to dab in. If your sushi chef sees you drowning your sushi piece in soy sauce and leaving behind pieces of rice swimming helplessly, that’s akin to someone pouring catsup all over the filet mignion they just prepared for you. Don’t mix wasabi paste into your soy sauce. That’s gross. Dab some onto your sushi piece and dip the whole thing, delicately into the soy sauce. 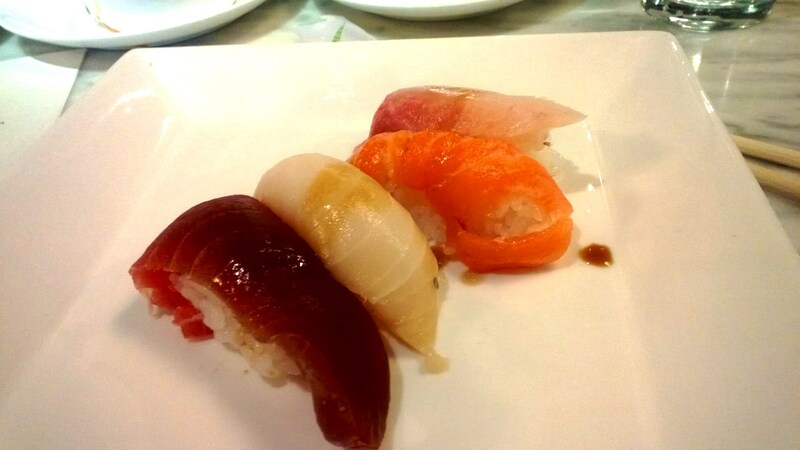 And if you have a piece of sushi that has fish on the outside such as Nigiri or Uramaki (look at me using the right terms! ), dip the fish side in your soy sauce (not the rice) and place the piece fish-side down onto your tongue. Oh, the rules! 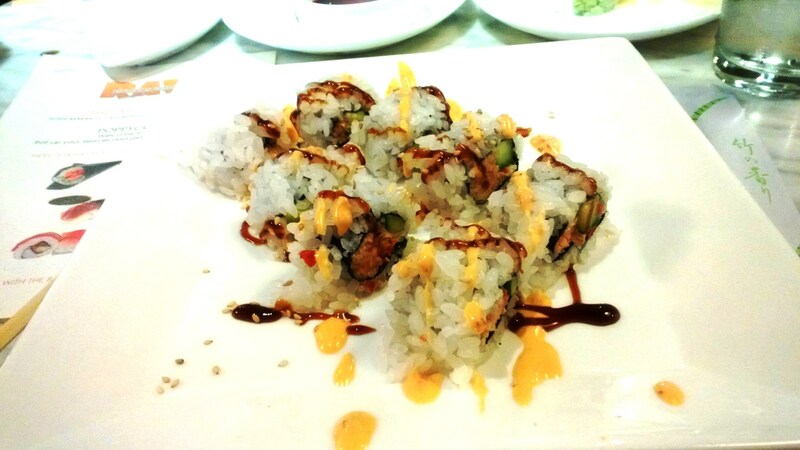 Depending on how old-school the place is that you go, the staff might be disgusted by your lack of sushi manners. But at TAG RAW, they are pretty low key. They know better but forgive you for not. Initial shyness between the students soon gave way to supporting each other through our efforts, encouraging and laughing and taking pictures for each other. It was really fun. I can imagine friends going together – get a group together and have a blast. Or, like me, go solo and learn a new skill, meet new people and break out of your safe zone. Being able to take a class in a working restaurant, during the lunch/weekend rush made us feel like we were sous (sous, sous, sous) chefs. We enjoyed seeing some of the lunch menu items being prepared and made us all want to return for lunch or dinner. The noodle bowls are huge and the bento boxes are a great deal for lunch at $10. With the subterranean location, across from the blue and white striped chocolatier and an eclectic clothing and accessory boutique, you feel like you are in your own special little world. There are upcoming classes on Fish Butchery Essentials, Sake Styles and Presentation and A Lesson for a Sweet Tooth. Classes cost $60 are a great deal considering all that you get to experience, learn and eat! “Like” In Good Taste Denver on Facebook. “Follow” In Good Taste Denver on Twitter. Write to us at ingoodtastedenver@gmail.com. I watch Japanese dramas where food, especially sushi and bento boxes are shown aplenty, so I read this article with much interest. I’ve discovered the joys of sticky rice and have eating with chopsticks down fairly well.